Add vibrant colour to your outdoor patio furniture with this bright high back cushion. Perfect for outdoor use, this beautiful cushion will lend comfort and style to your outdoor living space. Relax in comfort and style with the luxurious Stockton 4PC Chat Set from Hampton Bay. Perfect for the patio, porch or sunroom, the table and chairs combine a sturdy, rust-resistant steel frame with all-weather resin for many seasons of enjoyment. Woven olefin cushions complement the brown wicker finish for an elegant blend of color that enhances a variety of decor styles. The country beauty found in this Hampton Bay Woodbury Patio Sofa will create a cozy getaway right outside your home. Richly woven frames and supportive cushioning make for a true rest-and-relaxation experience. The seat cushions come in soft, durable, all-weather fabric that is stain, mildew and fade resistant for lasting outdoor use. 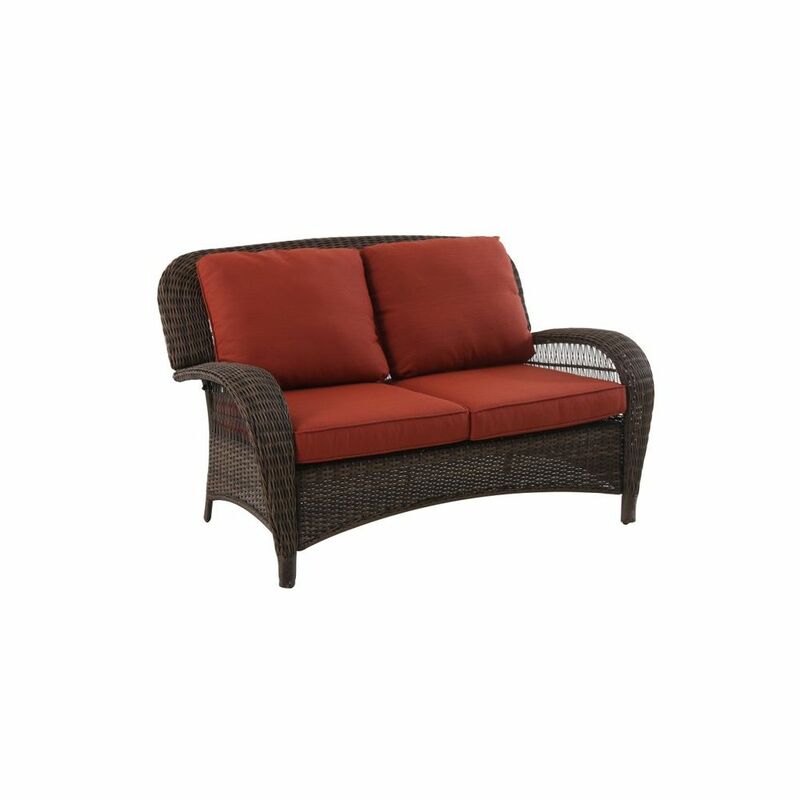 Beacon Park Steel Woven Loveseat Orange Cushions Relax in style and sophistication, and enjoy the outdoors with the Beacon Park Loveseat. A sturdy, rust-resistant frame supports intricately woven, rich brown wicker, and features a plush olefin seat and back cushion. Wide, curved armrests ensure maximum comfort you won't want to give up. Use as a standalone piece, or include other Beacon Park furniture elements to create a complete look.